A mini-retrospective looking at five series of work spanning 25 years. The series include: The Rodeo and the West and selected photographs from the Holocaust Project, Fifteen Clouds, The Therapist and Harbingers of Which Future?. Butler Institute of Art, Youngstown, OH. January – March 2010. ZaneBennett Contemporary Art, Santa Fe, NM. June – July 2006. New Mexico State University Fine Arts Gallery, Las Cruces, NM. August – October 2005. Orange County Center for Contemporary Art, Santa Ana, CA. December 2005 – January 2006. A visual exploration of the meaning of the Holocaust for us today. A series of works created in collaboration with Judy Chicago consisting of stained glass, tapestry and thirteen, large scale tableaus, which combine painting and photography in a unique manner. The series took eight years and the traveling exhibit which premiered at the Spertus Museum in Chicago in 1993 has traveled extensively. Orlando Museum of Art, Orlando FL, 2002. Lehigh University Art Gallery, Zoellner Art Center, Bethlehem, PA, 2000. Florida Holocaust Museum, St. Petersburg, FL, 1998. Tampa Bay Holocaust Memorial Museum and Education Center, St. Petersburg, FL, 1996/1997. Cleveland Center for Contemporary Art, Cleveland, OH, 1996. Austin Museum of Art at Laguna Gloria, Austin, TX, 1994/1995. Rose Art Museum, Brandeis University, Waltham, MA, 1994. Spertus Museum, Chicago, IL, 1993. Donald Woodman: Transformed by New Mexico, New Mexico History Museum, Palace of the Governors, Santa Fe, NM, February 23 – October 12, 2014. Donald Woodman, Galleri 69, Grünerløkka Lufthavn, Oslo, Norway, May 23 – June 2, 2013. Judy Chicago and Donald Woodman: The Four Questions, University of Colorado, Denver, CO, March 7 – May 9, 2013. Attractions…Addictions…and other Kodak Moments, Zane Bennett Contemporary Art, Santa Fe, NM, July – August, 2011. The Therapist, New Orleans Museum of Art, New Orleans, LA, May – August 2010. Selections from The Selling of the West and The Rodeo and the West, Art Museum of South Texas, Corpus Christi, TX, march – May 2010. Selections from The Selling of the West, Tom Thomson Art Gallery, Owen Sound, Canada, March – April 2010. Photography in Transition, Butler Institute of Art, Youngstown, OH. January – March 2010. The Rodeo and the West, Art Gallery of Calgary, Calgary, AB, Canada, July – September 2009. The Rodeo and the West, AXIS Gallery, Calgary, AB, Canada, July 2009. The Selling of the West, Zane Bennett Contemporary Gallery, Santa Fe, NM, June – July 2008. Harbingers of Which Future?, Harbinger Gallery, Waterloo, ON, Canada, September – November 2007. Photography in Transition, Orange County Center for Contemporary Art, Santa Ana, CA, December 15, 2005 – January 22, 2006. Photography in Transition, New Mexico State University Art Gallery, Las Cruces, NM, August 19 – October 8, 2005. The Rodeo and the West, Flanders Contemporary, Minneapolis, MN, October 16 – December 4, 2004. Harbingers of Which Future?, Millard Sheets Gallery at Fairplex, Pomona, CA, January 10 – February 29, 2004. Fifteen Clouds and Rodeo and the West, Paul Paletti Gallery, Louisville, KY, November 1, 2002 – January 2003. Fifteen Clouds, Flanders Contemporary, Minneapolis, MN, May 31 – July 6, 2002. Sources and Collaboration, a touring show curated and toured by the Austin Museum of Art at Laguna Gloria, exploring the creation and collaboration that went into the making of the Holocaust Project. Toured included: Sinclair Community College, Dayton, OH, 1995; Butler Institute of American Art, Youngstown, OH, 1996. Looking Back, Selections of three decades of work by Judy Chicago and twenty years of photography by Donald Woodman, Lyons Matrix Gallery, Austin, TX, 1994/95. Holocaust Project; From Darkness Into Light, Joy Horwich Gallery, Chicago IL. ; studies and photographs from the Holocaust Project, 1993. Lightworks of Santa Fe: Exhibition of photographs and manipulated photographs from the Holocaust Project, 1989. Installation/Environment at Roul’s, experimental art space, Santa Fe, NM, 1983. Masters of Fine Arts; Blaffer Gallery, University of Houston, Houston, TX, 1981. Janus Gallery, Santa Fe, NM, 1980. Hand Graphics, Santa Fe, NM, 1977. NCAR Gallery, Boulder, CO, 1976. The Motel Gallery, Albuquerque, NM, 1974. Prospect Street Gallery, Cambridge, MA, 1973. University of Cincinnati Fine Arts Gallery, Cincinnati, OH, 1968. Altared Spaces: The Shrines of New Mexico, New Mexico History Museum, Santa Fe, NM, September 30, 2012 – February 10, 2013. SoleMates: Cowboy Boots and Art, New Mexico Museum of Art, Santa Fe, NM, May – October, 2010. Attitude 2007, Invitational exhibition of international artists. Contemporary Art Museum, Kumamoto, Japan. July – October 2007. Photo print purchased for Museum Collection. Waldseee – 1944, an exhibition in memory of the annihilation of Hungarian Jewry, Hebrew Union College – Jewish Institute of Religion, New York, NY. July 19 – August 19, 2005. Common Ground: Discovering Community in 150 Years of Art, Selections from the Collection of Julia J. Norrell, Corcoran Gallery of Art, Washington, DC, October 2004 – January 2005. Aging: A State of Mind, curated by Laura Kruger, Hebrew Union College – Jewish Institute of Religion, New York, NY, September 2003 – June 2004, exhibition toured. Toni Price: Atomic Artist, Photograph in exhibition toured by TREX Museum of New Mexico, May 2003 – December 2004. Naked Before God, Group Invitational Exhibition at The Museum of New Art, Parnu, Estonia, May 2003. Jewish Artists: On the Edge, an invitational exhibition of Jewish artists whose work is both universal in outlook and informed by their life experience as Jews, College of Santa Fe Fine Arts Gallery and The Anne & John Marion Center for Photographic Arts, June 2000; Yeshiva University Museum, Center for Jewish History, New York, NY, August 2001 – April 2002. Photographic Fin-De-Siecle Self Portrait Show – Part Two – Toward A New Millennium, a group show at Andrew Smith Gallery, Santa Fe, NM, December 2000 – February 2001. University of Houston Graduate Students Past and Present, a juried exhibition at Lawndale Art Center as part of Houston Fotofest 2000, Houston, TX, March 2000. People: A Group Invitational Photographic Exhibition, LewAllen Contemporary, Santa Fe, NM, November 1998. Lawndale Live! A Retrospective 1979 – 1990; Lawndale Art & Performance Center, Houston, TX, 1993. 15th Annual West Art & the Law a traveling invitational show; sponsored by West Publishing Company, St. Paul, Minnesota,1991. Signs and Symbols; Houston Festival of the Arts, Houston, TX., 1981. Albuquerque II; Invitational show at the Albuquerque Museum, Albuquerque, NM, 1978. Celebrations; Group show organized by Minor White at M.I.T., Cambridge, MA, 1974. Octave of Prayer; Group show organized by Minor White at M.I.T., Cambridge, MA, 1972. Photo London: Beneath the Surface, Somerset House, London, UK, organized by the Victoria and Albert Museum, May 21 – August 24, 2015. Changing Perceptions of the Western Landscape, Albuquerque Museum of Art and History, Albuquerque, NM, May 18 – September 1, 2013. Cowboys Real and Imagined, New Mexico Museum of Art, Santa Fe, NM, April 14, 2013 – March 16, 2014. Rodeo Angel: Selections from Gay Rodeo and Rodeo and the West, The Brick Lane Gallery, London, UK, January 8 – 13, 2013. Selections from The Therapist Series, The Brick Lane Gallery, London, UK, November 6 – 19, 2012. Spectrum of Sexuality, Hebrew Union College, Jewish Institute of Religion Museum, New York, NY, September 6, 2012 – June 28, 2013. It’s About Time: 14,000 Years of Art in New Mexico, New Mexico Museum of Art, Santa Fe, NM, May 2012 – January 2014. March 2012, Site Santa Fe, Santa Fe, NM, March 2012. Albuquerque Now – Winter, Albuquerque Museum of Art & History, Albuquerque, NM, January – April 2010. Texas National, An exhibition juried by James Surls, The Art Center, Stephen F. Austin University, Nacogdoches, TX, April 9 – May 15, 2005. New Mexico 2000, a juried biannual exhibition at the Museum of Fine Arts, Santa Fe, NM, October 1999 – April 2000. In the Documentary Tradition, a group show of works by Alex Webb, Danny Lyon, Dana Salvo, Donald Woodman at Etherton Gallery, Tucson, AZ, January – March 1999. Iglesias Antiguas group show, Scheinbaum & Russek Ltd. Gallery, Santa Fe, NM, 1992. Contemporary Photoworks III, Albuquerque United Artist, Albuquerque, NM, 1986. 17th Dulin National Works on Paper, Dulin Gallery of Art, Knoxville, TN, 1986. TIP 85 FRIBOURG, 4th International Triennial Exhibition of Photography, Fribourg, Switzerland, 1985. Space X, Group show at The Armory for the Arts, Santa Fe, NM. Exhibited photographs and produced live video of opening, 1984. Selected Photographs, The Print Club, Philadelphia, PA, 1982. Six State Exhibition, ASA Gallery, University of New Mexico, Albuquerque, NM, 1982. Instant Image Show, Santa Fe Gallery of Photography, Santa Fe, NM, 1982. 40 Texas Artists, The Contemporary Arts Center, New Orleans, LA, 1981. Points of View, University of St. Thomas Art Gallery, Houston, TX, 1981. Celebrating Texas, Three person show at ME’s Gallery, Houston, TX, 1981. Houston/Galveston Black & White Photography Competition, College of the Mainland, Texas City, TX. Best of show and purchase award, 1980. Amarillo Competition 1979, Amarillo Art Center, Amarillo, TX, 1979. Polaroid Collection, Group Show of works from the collection, Cambridge, MA, 1979. Houston Photographers; Group show at The Museum of Fine Arts, Art School Gallery, Houston, TX, 1979. Brothers and Sisters, Group Show, Lawndale Annex, Houston, TX, 1979. Superspective, Group Show, Lawndale Annex, Houston, TX, 1979. Group Show, Santa Fe Gallery of Photography, Santa Fe, NM, 1978. Polaroid Collection, Group show of works from the collection, Cambridge, MA, 1977. Polaroid Collection, Group show of works from the collection, Cambridge, MA, 1973. New Mexico Biennial, Museum of New Mexico, Santa Fe, NM, 1973. Judy Chicago, published by Lund Humphries, London, UK, 2012. Deflowered – Judy Chicago, published by Nyehaus, New York, NY 2012. The Dinner Party by Judy Chicago, published by Merrell Publishers Limited, London & New York, 2007. Chicago in Glass, exhibition catalogue published by LewAllen Contemporary, Santa Fe, NM, 2006. 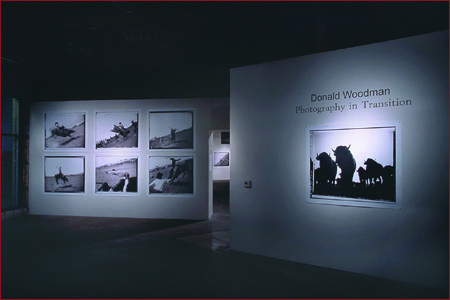 Photography in Transition, catalogue for traveling exhibition of photographs of Donald Woodman, published with New Mexico State University Art Gallery, Las Cruces, NM. Forward by Mary Ann Redding and essay by Edward Lucie-Smith, 2005. Kitty City: A Feline Book of Hours, by Judy Chicago, published by Harpe Collins, New York, NY, 2005. Judy Chicago Minimalism, 1965 – 1973, exhibition catalogue published by LewAllen Contemporary, Santa Fe, NM, 2005. Fragments from the Delta of Venus, by Judy Chicago, published by powerHouse Books, New York, NY, 2004. The Polaroid Book, photographs from the Polaroid Collection, published by Taschen, Cologne, Germany, 2004. Common Ground: Discovering Community in 150 Years of Art, Selections from the Collection of Julia J. Norrell, published by Merrell Publishers Limited, London & New York, 2004. “Rodeo as Metaphor”, interview and article by Lester Strong for American Aids Magazine, June 2004. Judy Chicago, Fragments from the Delta of Venus and other Femmerotica: A thirty-five year Survey, exhibition catalogue published by ACA Galleries, New York, NY, 2004. Judy Chicago, edited by Elizabeth A. Sackler, published by Watson-Guptill, NY, 2002. Coordinated and produced the photography for Judy Chicago: An American Vision, a monograph by Edward Lucie-Smith, published by Watson Guptill, NY, April 2000. Adam: The Male Figure in Art, by Edward Lucie-Smith, published by Rizzoli, NY, 1998. Photograph included in publication. Coordinated the photography for The Dinner Party, by Judy Chicago published by Viking/Penguin, 1996. Coordinated the photography for Beyond the Flower: The Autobiography of a Feminist Artist, by Judy Chicago published by Viking/Penguin, 1996. Staff photographer for American Builder Magazine – New Mexico Edition, 1994 – 1996. Holocaust Project: From Darkness Into Light, by Judy Chicago with photography by Donald Woodman, Published by Viking/Penguin, 1993. Photographs included in book, The Art of Memory: Holocaust Memorials in History by James E. Young, Published by Yale University Press, 1993. Photographed Bruce Nauman for New York Newsday, January 8, 1989. Photographed Agnes Martin for Vanity Fair, March, 1989. Octave of Prayer, Aperture, vol.17, number 1, 1972, photograph included in catalogue. First Chancellor’s Artists in Residence, Vanderbilt University, Nashville, TN, 2006. Visiting artist at the IRIS Center for Digital Arts Herron School of Art, Indiana University / Purdue University, Indianapolis, IN, 1999 & 2000.
International Friends of Transformative Art, Transformative Artist Award, 1992. Houston/Galveston Black & White Photography Competition; College of the Mainland, Texas City, TX. Best of show and purchase award, 1980. Awarded a Caleb Dustin Hunkin Foreign Scholarship to travel in Europe and pursue personal photographic work, 1965 & 1970. Awarded the Alpha Rho Chi award for Leadership, Service and Merit, University of Cincinnati, Cincinnati, OH, 1969. Three Performances by Judy Chicago, video produced by Nyehaus, New York, NY, 2012. Atmospheres: Duration Performances with Fireworks of Judy Chicago, Produced by Through the Flower, Directed by Kate Amend, 2002. The Dinner Party: A Tour of the Exhibition, Produced by Through the Flower, Directed by Donald Woodman, 2002. Resolutions: A Stitch in Time, Produced by Through the Flower, Directed by Kate Amend, 2000. Holocaust Project: From Darkness Into Light, Produced by Through the Flower, Directed and edited by Kate Amend, 1993. Technical Director/Set Designer for Theater in the Red, Santa Fe, NM. Productions include FOURPLAY, RED SEPTEMBER, BELLE NOTORIOUS, 1985. Space X; Group show at The Armory for the Arts, Santa Fe, NM. Produced live video of opening, 1984. Production of video tapes of the performances of Anne Waldman and Red Mole Theater for Center for Contemporary Art, Santa Fe, NM, 1984. Stage set design and construction of set for the play CONTRAOUS by Sara Lovitt production of Theater in the Red, Santa Fe, NM, 1984. Other Realities – Installations for Performances; The Contemporary Arts Museum, Houston, TX. Video tapes produced in conjunction with the Southwest Alternative Media Project of performances by Joan Jonas and Tina Girouard, 1980. The Panther; Video tape of this contemporary opera commissioned by the Houston Grand Opera, Houston, TX, 1980. Video tape interview of Stanley Marsh III, Amarillo, TX, 1980.